Henry Clay’s syndicated stallion Buzzard was originally imported from England where this hand colored engraving of him was published in 1796. Henry Clay was an early patron of the sport of horse racing, as were George Washington, Thomas Jefferson and Andrew Jackson. In addition to being one of the most popular public figures of his time, Clay was also devoted to improving various breeds of livestock, having imported the first Hereford cattle to the United States in 1817, and raising sheep, mules, and other farm animals. In the early 1800s, he began breeding Thoroughbreds and later maintained foaling records, race records, and feeding and veterinary information.In 1806 Henry Clay was a member of a Kentucky syndicate which bought the 18-year-old stallion, Buzzard, for $5,860 from the dispersal of John Hoomes of Virginia. The horse lived only two more years, but remains a noted sire of brood mares. 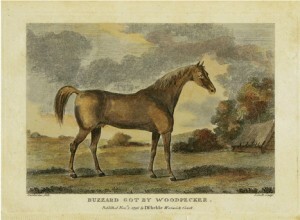 One of Buzzard’s daughters, bred by Clay, produced the unbeaten Woodpecker, whose 1833 match race with the Virginia invader Collier at Louisville over four-mile heats, was considered the most exciting horse ever seen in Kentucky up to that time. Henry Clay’s racing colors were buff and blue. It is believed that he chose these colors for his silks because they were the colors of the American Whig party. The American Whigs adopted the colors of the British Whigs who derived them from the buff and blue uniforms worn by American soldiers during the Revolutionary War. Clay began racing Thoroughbreds in 1808 and began to breed Thoroughbreds in 1830. In 1835 Governor James Barbour of Virginia sent Allegrante, the sister of the great imported horse, Camel, to Henry Clay. One of her best offspring, Zenobia, was willed by Clay to his son, John Morrison Clay. Henry Clay recorded the purchase in his stud book at $1,500 – a huge sum of money for a horse. In addition to Zenobia, Allegrante also produced Argentile, and from the two of them descended Victoire, Ann Hanley, Regards, Zadie, Lillie, General Duke, Chillicothe, Vandalia, Pomeroy, Estelle, Zampa, Zero, Zingara, Jerome, Edgar, Zaranaunie, C. London, D’Artagnan, and many others. Clay also purchased a half interest in Stamboul, the famous stallion, one of the four Arabians presented by the Sultan to Mr. Rhim, the American Minister to Constantinople. Clay maintained friendships with a number of horsemen. These included Lexington breeder Dr. Elisha Warfield, known as “the father of the Kentucky turf,” and owner of The Meadows, for which a Lexington subdivision is named. Clay was also intimately associated with William R. Johnson, the North Carolinian who became known as “the Napoleon of the turf.” Another friend, Wade Hampton II, of South Carolina, presented Clay with the mare Margaret Wood, by imp. Priam out of Maria West. In a letter to Clay, dated 3 June 1845, Hampton assured the senator that “To me she is of but little value, having her dam still breeding, her half sister Fanny, besides other of the same family.” He added, “She was foaled in 1840; at 3 years old she won the Trial stakes at Nashville . . . a very promising filly, but . . . utterly ruined by the Trip. She has been put to Herald, and I hope may prove in foal.” Margaret Wood was in foal and subsequently produced Heraldry while at Ashland. According to turf historian John Hervey, Heraldry produced for Clay a group of foals which became “one of the glories of The American Stud Book.” Heraldry had an outstanding racing career, which included a win in the Phoenix Handicap at Lexington, now recognized as the oldest stakes in America. Another friend, Dr. W.N. Mercer of New Orleans, sent Clay a filly named Magnolia out of imp. Glencoe and imp. Myrtle. Magnolia, which foaled the first great son out of Lexington in Daniel Boone, was the most important horse ever acquired by Clay. Finally, Clay was given the imported stallion Yorkshire, by Commodore Morgan of the US Navy. In an 1850 letter to James B. Clay the senator wrote, “John [M. Clay] won last week with the Glencoe filly by Yorkshire the Phoenix stake, and the next day he also won the two mile stakes with the Yorkshire colt from the Zhinghanie mare. I have not heard from home. You see that I did not judge so erroneously about Yorkshire.” Although not a major stakes winner himself, Yorkshire, sired a number of dams who issued major stakes winners. Perhaps the greatest legacy of Henry Clay and his Ashland Stud is the continuing success of descendants of that stable in major stakes races today. Between Margaret Wood and Magnolia, there are eleven descendants in the female tail line that have won the Kentucky Derby and many more who have won the other legs of the triple crown and other major stakes races. Yorkshire appears in the bloodlines of many of the most important horses in Thoroughbred history. Henry Clay would no doubt be very proud of the accomplishments of the progeny of his stable.